As you can tell, the plan for Anglesey also didn't come to fruition either. Such are the vagueries (spelling?) of sailing. The wind was constantly from the NE and the hoped for prtedicted easterlies did not happen. Although I had hoped to stay in the UK for easy transport routes home, we decided to fill in the gaps in S Ireland. Not so satisfactory as jumping on a train to get home, but at least accessable to Cork Airport. We had a particularly boisterous sail across St Georges Channel with the predicted NE 4-5, gusting 6 turning out to be more like 6-7, gusting 8. Needless to say we made a very fast passage with all 3 reefs in the main and a small scrap of genoa, but were releived to get into the shelter of Ireland away from the swell and more frisky breaking waves which were regularly dumoing their mass in the cockpit. It is a long time since we wore full waterproofs. Despite all this, it was a lovely sunny day and we were accompanied regularly by playful common dolphins. 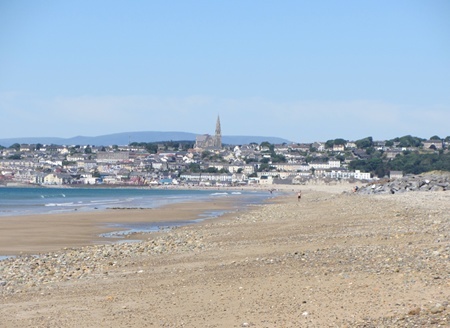 Our first landfall was Tramore Bay,a huge wide expanse of sand with the town at the western end. we anchored on the opposite side, quite a way from the shore due to the shallowness of the water. Tramore from half way along the beach from where we landed. We landed the dinghy and pulled it a way up the beach although the tide was on the way out, and walked about 2 miles along the beach to the town for a look. It was dreadful!! Full of amusement arcades, fast food stalls, funfairs and too many people! It did redeem itself however as we walked to the top of the hill for the supermarket.A lovely green with a church and some pleasant houses. We tramped back along the beach with heavy rucksacks towards the distant dinghy, high and dry, about 400 yds from the sea. After carrying this to the waters edge and swimming/rowing to the distant "mother ship" we both felt as if we had had our daily exercise! We moved on in the afternoon to have a look at Youghal (pronounced Yawl, as we found out when we ventured Yule!) This was well worth the stop. 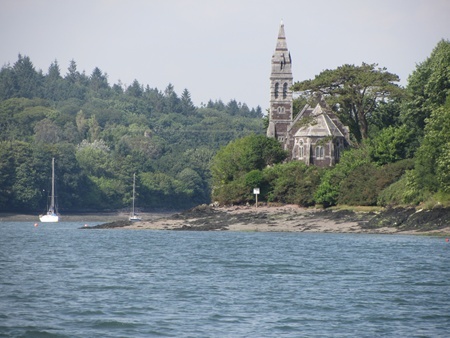 We anchored up the estuary opposite the town which has alot of interesting history and is attractive. We explored the old walls and related buildings and read about Cromwell who left from here after he had converted Ireland to his cause, The bikes came out and we had a lovely cycle ride over the headland into Ardmore to look at one of the best preserved round towers, built by monks at thier monastries to escape with thier valuables, away from various enemies. 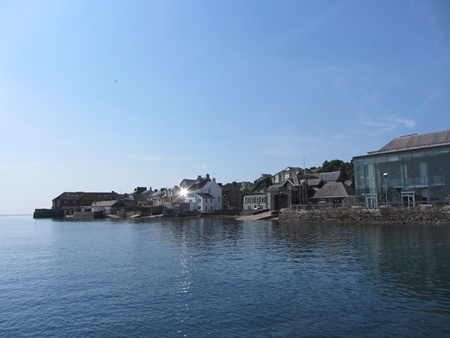 The following day we went alonside the new pontoon, (No overnight stays. Overnight stay 5 euros!??) and filled with fuel from a freindly mobile tanker who arrived 20 mins after requesting, filled with water and did a load of hand washing. Very productive and fun bantering with the local fishermen and ferrymen. The next stop was Cork Harbour where we anchored on the east side of Great Island and enjoyed a rather hilly circumnavigation b y bike taking in Cobh as we went. The time has now run out as I have to go home again from Baltimore and need to get my first bus of 3 to take me to Cork Airport. More Ireland to follow in due course. Cruising the Rivieras. Iles Frioul 43:16.70N, 05:18.70E.